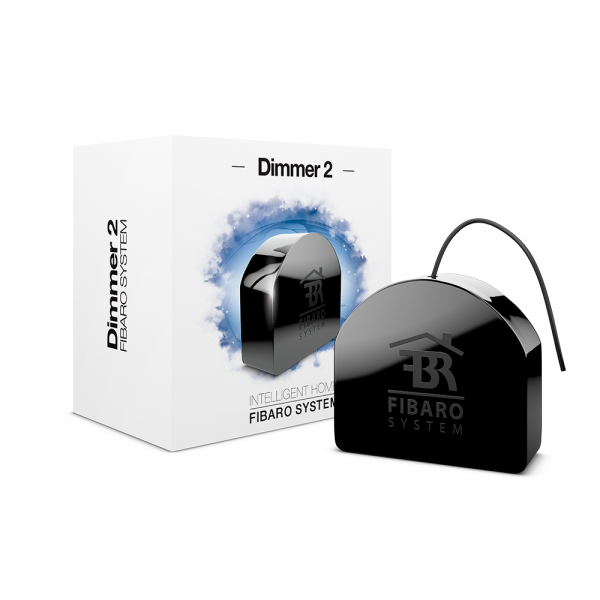 Product information "FIBARO Dimmer 2"
With the FIBARO Dimmer 2, you can integrate existing lighting installations into a Z-Wave network. Thus, the connected devices can still be controlled and dimmed with the existing wall switch, but – thanks to Z-Wave – also via remote control, smartphone or sensor-controlled automation. The compact radio module is placed in a wall box right behind the normal switch. The switch is no longer directly connected to the load but acts as input device for the FIBARO insert that is controlling the load. The switch only sends control signal to the insert which controls the load then again. The solution works with all switch design. You can use a momentary or a toggle switch. It’s recommended to use wall boxes with 65mm depth. But smaller boxes with only 45mm depth can be used also if there is enough space behind the switch. The available space depends on the size of the traditional switch, the dimensions of the wall box and the amount of additional cabling placed in this box. Related links to "FIBARO Dimmer 2"
Z-Wave Plus™ is a new step within the Z-Wave certification process, designed to help consumers identify products that take advantage of the recently introduced 'GEN5' Z-Wave hardware platform, also known as 500 Series or 5th Generation Z-Wave. Z-Wave Plus certified solutions feature a selected set of extended features and capabilities that enhance the end user experience and make Z-Wave installations even faster and easier to install and set up. Z-Wave has led the market in interoperable smart devices for the home since the first Z-Wave product was certified in 2004. With the introduction of the GEN5, Z-Wave 500 series hardware platforms, Z-Wave saw its ecosystem bolstered with new capabilities – including increased range, extended battery life, Over-The-Air upgrading (OTA), additional RF channels and more. Products with Z-Wave Plus™ are fully backwards compatible with existing Z-Wave products! For consumers, homeowners, integrators and service providers, these enhancements offer tremendous benefits in terms of faster and easier installations, more extensive device profiles, improved self-healing and longer battery life. With the new Z-Wave Plus certification program, the Z-Wave Alliance is introducing a series of packaging logos that will be located on every Z-Wave Plus™ certified product, informing the consumer this product incorporates the enhanced capabilities of the Z-Wave 500 series. Subscribe to our free newsletter and ensure that you will no longer miss any of our shop offers or news.